Hello and welcome back to Off Cuts. We sincerely hope everyone has been as OK as they can be over what has been the very wettest winter (albeit not the coldest!) ever on record.Our surrounding residential areas in Staines, Wraysbury, Virginia Water, Datchet and Egham suffered greatly and featured prominently on the news. Luckily our business park has a 30ft brick wall – the ultimate protection between us and the Thames! So we escaped unscathed, an island of dryness in the sea of the river. The good news though from all the grief and disruption, is that we can put all those old cuts of carpet to good use by working with the local community, and encourage those that are in need of temporary or replacement carpets to come and take their pick from the remnants pile. In this issue you’ll also find a feature on rugs put together by our Design Studio, as well as a jargon-busting low down on pile reversal, shading and watermarking. AND finally, but no means least, don’t forget to enter our competition for the now infamous Gravity Cupcakes. Looking forward to seeing you in the Summer and hopefully with some better weather. 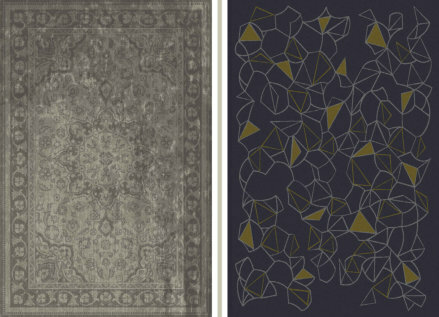 There appears to be an insatiable appetite for rugs at the moment, and the Gravity Design Studio has been working hard to satisfy this craving. "There is so much that can be done. A particular favourite at the moment is the combination of both 100% wool with viscose in similar tones which give the rug a sophisticated 3-D effect and luxurious look that is just begging to be touched. We are also breathing new life into traditional designs with the addition of a distressed effect. But even a simple design can be transformed with a bit of careful carving or by using different pile heights, geometrics being most popular." Much of what we have been doing is bespoke. People know what they want and we enjoy working together with our clients to realise their vision, and if they don’t know what they want we are continuously boosting the bank of Rug designs on display on the website.Many of our recent projects have required both fitted carpet as well as areas with rugs. This type of scenario makes Gravity the ideal choice because not only do we provide both, but in addition our hardwood flooring range provides the ideal surround for your chosen rug. Whether its Handmade or Axminster, inset or loose-laid, our rugs are the perfect tool with which to make a design statement. Go on, treat yourself. Just because the festive season is behind us doesn’t mean you can’t indulge well into the New Year too. INDUSTRY EXPERT: WHAT IS PILE REVERSAL SHADING? Permanent Pile Reversal Shading is a phenomenon that can appear in any cut pile carpet. Its occurrence is random and its causes are largely unexplained. It is also commonly referred to as watermarking, pooling or puddling. 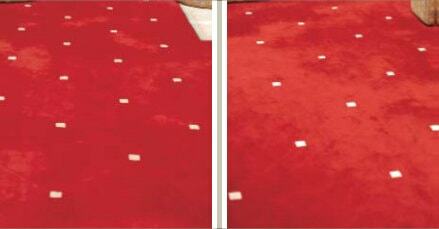 A cut pile carpet that has ‘shaded’ will show areas lighter or darker than the surrounding carpet pile. This variation is caused by the reflection of light from pile tufts which come to lay in different directions. Visually, Permanent Pile Reversal Shading is not unlike the brushed appearance of other cut pile fabrics such as suede, velour and velvet, although the appearance change in a carpet that has ‘shaded’ will be permanent. Permanent Pile Reversal has been associated with cut pile carpet for many years, in fact well before the advent of machine made carpets. Despite extensive research and development of methods and techniques to minimise the occurrence of shading, the characteristic is not predictable. The pictures above are of the same carpet viewed from two different angles and show the effect of light being reflected and absorbed. It shows that the permanent pile reversal shading is more evident in the photograph on the right, compared to the photograph on the left. The degree of ‘shading’ seen will depend on the angle of viewing and the ambient light source. Watermarking, pooling and puddling are terms used to describe irregular areas of light or dark in the carpet that may resemble water spillage marks. These effects are permanent and referred to as Permanent Pile Reversal Shading. The appearance change is permanent – it will not go away. – Its occurrence will not lead to premature wear of the carpet and it will have no effect on the durability of the carpet. – It has not been linked to methods of installation. Although research from around the world is inconclusive, location factors are thought to be linked to the incidence of permanent pile reversal shading. This can be seen in the photograph here, where permanent pile reversal shading contours run across the boundaries of carpet tiles and therefore suggest that location factors can be integral to the occurrence of the phenomenon. However it has not been possible to isolate the specific factors responsible although floor temperature, humidity, air currents, static electricity and earth rays have all been investigated as possible causes.